Kunin pokes at a puck that Jones has covered, and a scrap starts in front of the Penn State net. Penalties coming. Teams assessed off-setting minors so it will be 4-on-4 for two minutes. Teams are back to even strength. 2-0 PSU with under seven minutes in the first. Badgers are being sloppy in the defensive zone and it almost cost them. Penn State gets called for a penalty and UW gets their first PP chance of the contest. Badgers will head to their first power play as Penn State is assessed a cross-checking minor. 4:51 left in the first with UW down two. PSU's Pedrie is called for cross-checking in front of his net, and UW gets its first power play. PSU leads 2-0 with 4:51 left in the first. Badgers' power play expires with nothing to show. Under three minutes left in the period. Berger nearly slips the puck five-hole, but Berry squeezes the pads together, still 2-0 Penn State with 1:27 left in the first! Really nice video played at the Kohl Center between periods honoring former Badgers coach Jeff Sauer. Time for the second period at the Kohl Center. Penn State leads Wisconsin 2-0 as the second period starts at the Kohl Center. UW attempted 25 shots to PSU's 12 in the first. 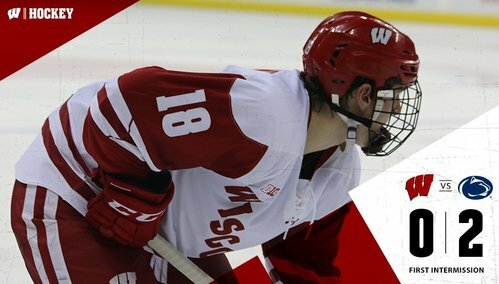 Sexton is given an interference minor and the Badgers will be a man down for the second time. Two minutes gone by in the second. UW's Sexton is called for interference. PSU on the power play 2:09 into the second, leading 2-0. UW's Tischke makes a hard charge up the right wing shorthanded and crashes into the net. PSU's Kerr is down hurt.